Scent: Powerful, fresh, camphorous, somewhat green and bittersweet scent. Action: Anthelmintic, antibacterial, antifungal, antispasmodic, choleretic, diaphoretic, diuretic, emmenagogue, nervine, stimulant, tonic, vermifuge, antiparasitic. Benefits, Indications: The essential oil is good for women’s complaints and supports the womb. It eases painful menstrual cramps, relaxes tension through the abdominal area and encourages blood flow when periods are delayed or scanty. With skin complaints mugwort is said to alleviate eczema, acne and psoriasis. It is also helpful with actinic keratosis, reducing the abnormal cell production and promoting healthy cell growth. Some of the research shows that mugwort is useful for arthritis and other inflammatory conditions of the joints. It eases achy muscles and stiffness and brings increases circulation to the affected area. It can also be effective in loosening phlegm and mucus, especially with bronchitis and chest colds. It is used today for intestinal complaints, worm infestations, headaches, muscle spasms, circulatory problems, menstrual problems/PMS, dysentery, gout, and as a treatment for hysteria and epilepsy. Precautions: Oral toxin, avoid in pregnancy and with infants and children, thujone can interfere with brain and nervous system function. Mugwort oil should not be used in aromatherapy as it is considered to be toxic, a neurotoxin and an abortifacient. Chemical Composition and Antimicrobial Activities of Artemisia argyi Lévl. 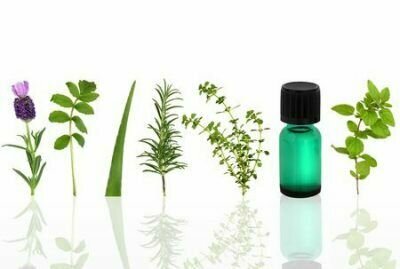 et Vant Essential Oils Extracted by Simultaneous Distillation-Extraction, Subcritical Extraction and Hydrodistillation.